The 2020 Golf Open is returning to Sandwich ... stay with us! "I would like to say that the experience with yourselves has been excellent, your service was prompt, the paperwork easy to read and nice and simple yet informative. I do not hesitate to think of you for future stays in the area." "We've been travelling through Britain since 1992 and Little Holcombe is one of the best cottages we ever stayed in. We had a lovely week in Kent and hope to be back again." "I am delighted with the level of bookings and am very impressed with the service I have received." "I love this agency. I use it for groups of friends and also our family use it for holidays. I use this service because I'm confident I'll get a place of a high standard that is managed professionally. And I've always got local information from the staff if I needed it." "Thanks for the superb service provided by you and your colleagues, the best I came across during my two day search for a cottage!" "Kent is such a lovely area with lots of places to visit. The property was situated near to most main towns, shops and nature reserves. The service and information your company provided was very helpful and informative. We would definitely holiday with Kent and Sussex Holiday Cottages again in the near future." "We saw a number of agents before placing our property with Kent & Sussex Holiday Cottages. We chose them because they came across as both professional and trustworthy – key to a successful business relationship. 8 years on and I couldn't be happier." "Can I just say how pleased we are with the number of bookings... just fantastic thank you!" "The Studio is stunning inside and out, and was everything and more than we had hoped for, so well equipped, comfortable and modern. Such lovely spaces which worked so well for our family. We feel you got it just right!" "We have had a great year up to now. In fact this week is our first empty week after a straight run of 12 weeks I think, so well done to you and your team; thank you." Welcome to Kent and Sussex Holiday Cottages. 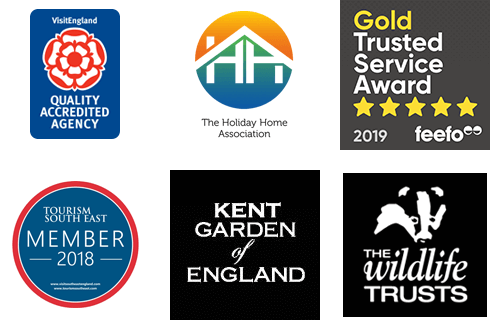 We are one of the South East's longest running agencies providing 300 quality self-catering cottages in these picturesque counties. Having rebranded in 2014 from Freedom Holiday Homes and Curlew Cottages, we are a family run company with over 30 years’ experience with a friendly, knowledgeable, local team who are on hand to make booking and staying in our cottages a pleasurable experience. Kent, the ‘Garden of England’, with its gently undulating hills and abundant orchards is famed for its hop gardens and Oast Houses, together with a growing industry of winemaking. The diverse but spectacular coastline with seven wonderful sandy bays along the Thanet coast to the colourful pebble stone beaches stretching from Sandwich to Hythe, dotted with an abundance of history, our grand castles and tales of smuggling to name just two. If history is not your cup of tea, we have a vast mix of attractions and places of interest along with great shopping destinations. Dreamland in Margate, a family attraction from the past that has been recreated, The Turner contemporary gallery standing in prime position on the seafront together with wildlife parks to suit all ages. Canterbury town centre offers a cultural experience with West End shows at the Marlowe Theatre and of course the glorious Cathedral. Cycling along the network of cycle paths both on and off road are another way to take in the scenery and enjoy the glorious countryside. Just 21 miles away is France, which on a clear day can be seen with the naked eye. So, if you fancy a day trip during your stay, don’t forget to pack your passport. Ferry sailings from Dover or trains from Eurotunnel at Folkestone are available. Sussex, East and West, 1066 country, with glorious beaches, including Camber which is the only sand dune system in East Sussex, ideal for kite surfing and also adorable villages nestling in the idyllic South Downs fabulous for rambling, dog walking and to rest your weary legs in one of the many welcoming pubs. Steam train enthusiasts will be in their element here with The Kent and Sussex light railway and the Bluebell line. Further along the coast is Brighton, famous for its lanes, a shopper’s paradise made up of a fantastic maze of twisting alleyways giving a creative edge to your shopping in the many independent shops and boutiques. From quaint coastguard and fisherman’s cottages to bright modern seafront apartments, our collection of properties is waiting to be snapped up. Your next holiday is just a click or a phone call away. Read award-winning blogger Sian's review of her stay at Hartley Dyke Barn in Cranbrook here, where she enjoys exploring the Kent countryside and returning to a cosy fire in the evening! I recently spent an enjoyable day at Doddington Place as a spectator on my husband's falconry day birthday treat. I was a little dubious about spending the day as a spectator as I thought there would be a lot of standing around.